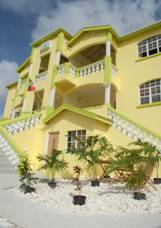 Alpha Suites is a luxurious 5 unit Apartment complex, offering a unique blend of charming island hospitality and comfort for either the visitor or long term resident. The property includes four two bedroom units and a studio apartment. We are conveniently located in an upscale quiet residential neighbourhood approximately 4 miles from St. Johns and 6 miles from the Airport. Each air-conditioned unit is fully furnished and self contained with its own washer, dryer, refrigerator, stove, microwave oven and all other kitchen appliances and amenities. Your unit comes inclusive of Cable TV, High speed Internet access, standby generator power and a weekly maid service for added convenience. All rooms are with a queen-sized bed and come with a complete set of linen. All windows are fitted with specially designed security screen for additional safety. Each unit has two private patios one of which is furnished.